The tropical fish keeping of Siamese Fighting Fish (Betta splendens) is by far one of the most wide spread activities that newcomers to the fish keeping hobby enjoy. The Betta (Betta splendens) is one of the most popular and well known freshwater tropical fish species in the world. Well over 100 years ago, tropical fish keeping enthusiasts in Thailand and Cambodia began breeding Bettas to emphasize their colors and to enhance other qualities, like their long delicate fins. Over the years Bettas have been transformed by breeders from a rather drab fish to their current status as one of the most beautiful fish in the aquarium hobby. In the wild, Bettas are found in the slow moving rivers, ponds, rice paddies, puddles, and drainage ditches throughout Southeast Asia. All species of Betta are small fish but they vary considerably in size from under 1 in (total length) in B. chanoides to 5 inches for the Akar betta (B. akarensis). Because they are all anabantoids, Bettas are capable of living in low oxygen water conditions that would kill most other species of tropical fish. Bettas have a unique organ called the labyrinth which allows them to breathe atmospheric air and to survive in severe conditions. It also aids in their breeding activities. Of the over 73 recognized species of Bettas known throughout the world, many Betta species are common (B. splendens) in the aquarium trade, however, other Bettas such as B. persephone have been listed as “Critically Endangered”. Several other species are listed as endangered or threatened, primarily due to the reduction of their natural habitat. Beginning tropical fish keeping enthusiasts usually find Bettas sold in small bowls or plastic containers in pet shops, department stores, etc. This is by no means the best way to keep Bettas in an aquarium environment. They need at least a 1 gallon tank that is well filtered and can be kept at a steady water temperature of between 75° and 86°F. They do best in a shady well planted tank with plenty of surface cover and a variety of hiding places. Tropical lilies, tall stem plants, floating plants like Riccia spp., Salvinia and Cryptocoryne spp. are excellent choices for subdued lighting conditions. Other plants like Microsorum or Taxiphyllum spp. can be attached to driftwood and rocks, caves, pieces of clay flower pots, etc. should be placed in the tank to provide additional shelter for the fish. For breeding tanks, many tropical fish keeping enthusiasts add some beech, oak, almond, or other type of dried leaf litter to the tank. As the leaf litter decomposes, tannins are released and beneficial microbe colonies and microorganisms form to provide a food source for the fry. Because Betta Splendens inhabit slow moving waters in their natural habitat, filtration should not be too strong. An air powered sponge filter is all that is needed. Bettas are excellent jumpers so you do need to cover their tank. Leave an air gap for them to occasionally gulp air. 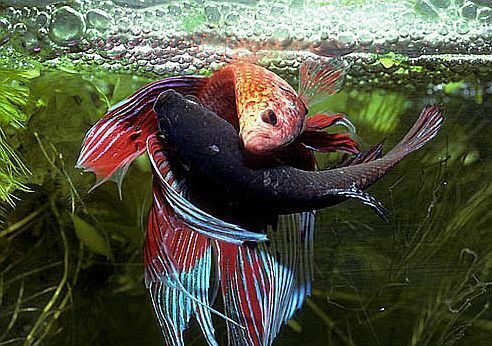 Male Siamese Fighting Fish are highly territorial and aggressive towards males of their own kind as well as other brightly colored tropical s that could be mistaken by them as their own species. For this reason they are best housed alone or in a large community aquarium of selected species. Based on their breeding activities, Bettas are usually divided into two groups; bubble nest builders (like Betta Splendens) and mouth brooders (like Betta Picta). The mouth brooders are generally found in fast moving stream environments are are believed to have evolved from bubble nest builders that are found in rice paddies and stagnant water. Wild Bettas are hardy, opportunistic feeders and will eat almost anything in their environment. This includes mosquito larvae, worms, tubifex, daphnia, small insects, and even small fish. Although Bettas are NOT recommended for the standard community tank set-up for reasons already touched upon, they are often successfully kept with tank mates that they cannot intimidate. Avoid keeping them with fish that have similar shaped or long trailing fins that males can identify as rivals and then only keep one male per tank. Many aquarists keep a male with several females in a single species tank with great success. 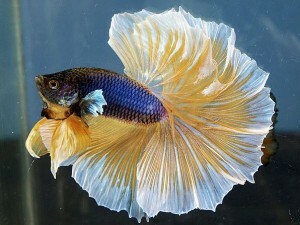 The Betta Splendens is a bubble nesting species and is relatively easy to breed. Set up a tank with a tight fitting cover and NO GAPS. The fry will need access to warm humid air in order for their labyrinth organ to develop. Place the pair in a planted tank with some fine leaved surface vegetation or a broad leafed plant. The male will construct a bubble nest on the surface, under a leaf or among the surface vegetation. During nest building, the male will not tolerate the female in its vicinity until it’s completion. Prior to spawning the body color of the female will pale and bars will appear on her flank. The male will wrap himself around the female usually directly under the bubble nest and at the point of climax, milt and a few eggs are released. The female catches the eggs between her pelvic fins and her body. The male then transfers the eggs to the bubble nest while the female recovers. The process is repeated until the female no longer expels any eggs which could take quite some time. The male guards the nest until the eggs hatch, usually in 24 to 48 hours. The fry remain in the bubble nest until their egg sacs are fully absorbed, usually in 3 to 4 days. All during this time the male will catch and return any eggs that fall from the nest and if disturbed, the male may move the nest to another location. When the fry become free swimming, the male will lose interest but unlike other tropical fish, the adults will not usually eat their young. Feed the fry infusoria for the first few days until they are large enough to accept micro worms and brine shrimp. For optimal growth, offer the fry small feedings of different foods 2 -3 times per day. Betta Splendens have been hybridized and selectively line-bred for the aquarium trade, leading to the development of several color forms that do not occur naturally.